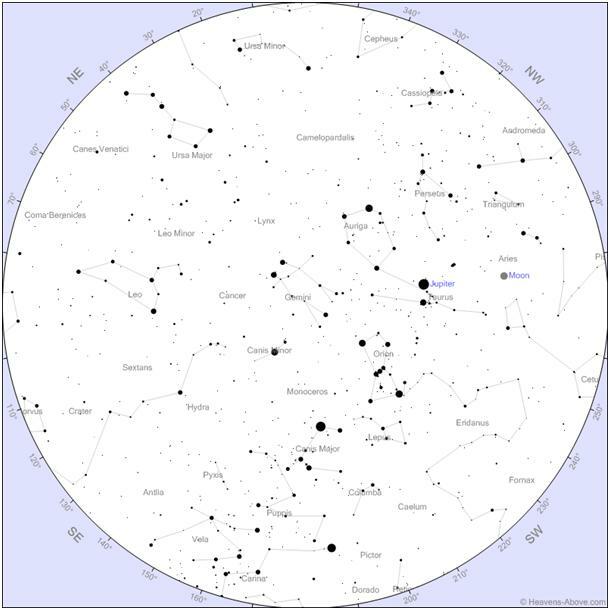 The next meeting of the Astronomical Society will be at Pedro’s Castle starting at 7:30 PM onward on Wednesday 12th June 2013. All are welcome and there is no charge for occasional visitors. Ring or email if the weather looks bad and you are still intending on coming. Meetings are canceled if there is more than 50 percent cloud cover. I would like to remind all who have been previous members to join us again this year. Please send cheques for 25 dollars to PO Box 1601 GT , or of course you can pay on the night! 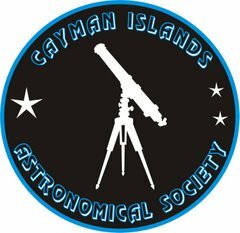 The next meeting of the Astronomical Society will be at Pedro’s Castle starting at 7:00 PM onwards on Saturday 13th April 2013. All are welcome and there is no charge for occasional visitors. Ring or email me if the weather looks bad and you are still intending on coming. Meetings are cancelled if there is more than 50 percent cloud cover. 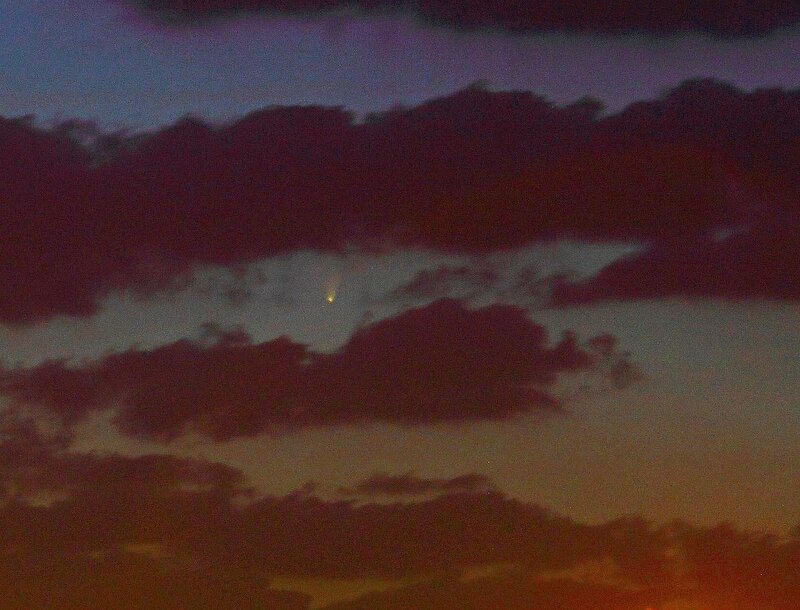 Comet PanSTARRs (C/2011 L4) came and passed us by. Mike Whiteman took a great photo between the clouds after Sunset to capture the comet but its brightness was very disappointing. I know no one who saw it with the naked eye. 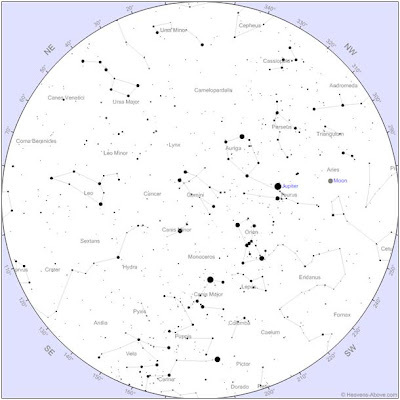 Observers further north can take advantage of the fact that the comet – currently in the constellation of Andromeda will set a lot later after sunset than here. The comet has now a much more pronounced fan shape to the tail rather than that seen when it was closer to the Sun as in Mikes photo. On this evening the Moon is seen not far from Jupiter, and also the bright red star Aldebaran in the constellation of Taurus will be nearby too. This sort of alignment doesn’t really have a special significance but it’s interesting to look at! There are two bright planets visible in the evening this month, we have the brilliant Jupiter now very much in the Western Sky and also in the East we now have the planet Saturn. Between the two planets – you should also be able to make out the two bright stars of the constellation of Gemini whose names I always enjoy – Castor and Pollux and moving further to the East the red star Regulus, which is in the constellation of Leo. As the month progresses and if we watch at the same time each night Jupiter will set earlier into the West and Saturn will rise earlier in the East. To the ancients the planets appeared as bright “wandering stars”, the word planet comes from the ancient Greek meaning literally as wanderer. 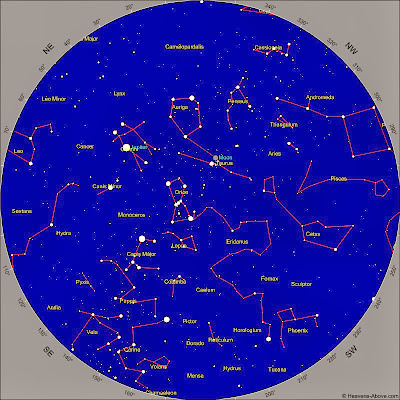 However the “wandering” of the planets is more about the planets moving against the background of the stars over several months rather than the measured changes we are seeing here this month. That background of stars was divided up by early mankind into constellations, and not necessarily the ones we call them today. There is another small change to the planet position in their slow moves to the east – which I think probably went even further to their name of “wanderers” and that is an effect called retrograde motion. Here an outer planet for example Jupiter will be seen to start moving “backwards” for a short while and then change direction again back to the east. This effect, easily explained in text books (and avoided here for brevity) is due to the Earths own motion around the Sun. Jupiter will be heading “backwards” later this year in November and December before resuming again in an easterly direction in January.